The Future of P.V. Garden Club: Why Should You Care? When most people hear the name “Garden Club”, the first thing they probably think is the stereotype of ladies having lunch and talking about floral arrangements. Think again! P.V. Garden Club is much more than that. In a town that relies on tourism, the garden club’s mission of Beautifying Vallarta makes all other endeavors here more successful. Without a vibrant economy, the businesses and none of the other worthwhile charities can thrive. The PVGC Board recently worked with a professional who helped us plan for the future by clarifying our purpose. 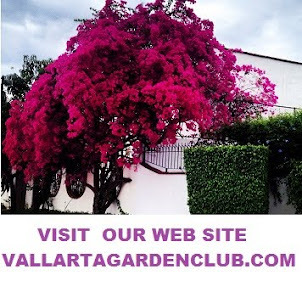 We rebranded ourselves as PV Garden Club -Beautifying Vallarta. The tag line will always accompany our name so everyone knows what we really stand for. Immediately after the end of the Bugambilia Festival, we felt it was critical that we build on our success and continue to make a difference in Puerto Vallarta. Of course the primavera trees and bougainvillea throughout town will be pruned and taken care of during the summer. We want to expand our planting scope, but without more participation that is harder. We are a multicultural organization and welcome involvement from the people who have the most to gain: local year round residents of Puerto Vallarta. Our facebook page is going to be lots more fun too. We are upgrading it to include “green” lifestyle insights, recipes, and of course lots of photographs of the gorgeous flowers of the tropics. PV Garden Club – Beautifying Vallarta.